In their public speeches Western policymakers would go above and beyond in an attempt to stress their particular fondness of Washington’s vassals that are bound to fulfill any demand of their harsh master, while pretending that all this is a part of some sort of a rule-based political order that is lauded in the Western media. Those figures would take particular care to praise the political puppets that the US would put at the very top in a number of satellite states to exercise direct control over those nominally sovereign states from the capital of the empire. Among those puppets one can find such well-known Ukrainian and Georgian politicians as Poroshenko and Saakashvili respectively. 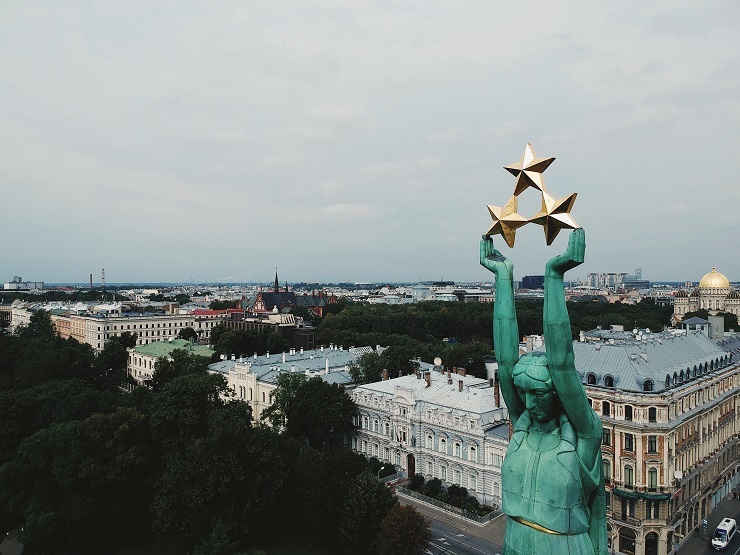 And the Baltic States are no exception, as American democracy-loving oligarchies would install a 54 years old native of state Delaware, Krishjanis Karins as Latvia’s prime minister. It’s remarkable that a local business media source Dienas Bizness would praise this fact by running an article titled “Now the US has its own prime minister of Latvia!” (sic) in which it would express its confidence that Latvia should be proud of the fact that its newly-elected prime minister is a US subject, which puts him under direct control of Donald Trump. In turn, in a desperate attempt to show their gratitude to the US for this kind of “patronage”, the Baltic states would try hard to master the ancient art of Russophobia, while praising their surviving Nazi accomplices – the so-called “forest brothers”, in spite of the fact that the international community has taken a rather harsh stance on the attempts to praise the Third Reich and its criminals. Yet again, in a desperate bid to manifest their loyalty to Washington, Estonians would hold military parades 600 feet away from the Russian border, thus clearly provoking Russia’s response. One can only imagine the outcry in the Western media, if Moscow chose to roll its tanks along the border with any of the Baltic states! However, it goes even further than that, as the defense ministers of Estonia, Latvia and Denmark signed an agreement on the establishment of the Headquarters Multinational Division North within NATO’s chain of command. The primarily task of the North division will be both the planning and management of military operations, along with training camps establishment. The headquarters of this division has already opened in Latvia – at the territory of NATO’s military base in Adazhi, some 18 miles from the country’s capital – Riga. However, against this background, one can’t help but remember a BBC produced sci-fi movie about the prospects of the next major shooting war in the Baltic States, where the rationale behind starting WWIII over countries the size of a couple of blocks of an average European capital was questioned for the first time. This same question has recently been raised on the Fox News, when the host Tucker Carlson demanded a former outside foreign policy advisor of Barak Obama, David Tafuri why American sons should be expected to sacrifice their lives fighting for such minuscule states. Some people may be oblivious to the fact that in accordance with Article 5 of the NATO Charter, the Pentagon will be forced to ride to the rescue of the Baltic States whenever something may go wrong in one of them. This is not a theoretical option, it’s an obligation, and this fact has been rightfully stressed by Tucker Carlson. With American taxpayers footing most of NATO’s bills, are they expected to sacrifice their lives for the Baltic states on top of it? If so, should we just write off the mutual animosity between Americans and the residents of Baltic states that hides behind the servile official rhetorics of Riga, Vilnius and Tallinn? A year ago, a local Latvian newspaper Neatkariga Rita Avize ran an article about the reaction of Latvian residents to Washington’s attempts to bring down the largest Latvian bank – ABLV Bank, while accusing sitting Latvian officials of assisting the US. The article noted that Americans don’t have a habit of utilizing their most trusted allies as toilet paper or a punching bag. However, the author who penned this peace had to recognize that in times of need, Americans would still “wipe their asses” with those allies. With this being said, it was only a matter of time for some incident to occur, however, nobody could expect what was to happen on March 8. On that day two American servicemen decided it would be fun to take a piss on the main monument in Latvia, the Freedom Monument. However, this wasn’t the only manifestation of the contemptuous neglect that Americans show to the Baltic countries. Back in 2016, in the Lithuanian city of Kaunas, US servicemen tore down the national flag of Lithuania from the chief prosecutor’s office and desecrated it. However, the Pentagon decided that no disciplinary measures were needed in this case. The US attitude towards the “cultural heritage of the Baltic states” can be witnessed firsthand in the American movie Perspective that was released last year. In this movie its main characters would be tortured by the songs of popular Latvian pop musicians Zorzs Siksna and Imants Kalniņs. For sure, there’s such American nationals who can go on for hours about their affection for the young Baltic republics, and George Soros is among them. He would typically brag that he has spent some 90 million dollars on “promoting democracy” in Latvia. However, the same Soros deliberately omits the fact that it is precisely because of his collaboration with the sitting local officials Latvia’s external debt exceeds 12.5 billion dollars, which amounts to 6,837 dollars of debt weight that each resident of this republic carries on his shoulders. It goes without saying that even to service such a debt Latvian taxpayers are forced to pay 1.1 million dollars a day! Among the outstanding achievements of George Soros that should be mentioned, there’s the fact that he wiped the Latvian financial sector clean from local competitors. But before proceeding with this he insisted that the guarantee funds of a number of Latvian banks targeted by Washington, namely Latvijas Krājbanka, Trasta komercbanka and ABLV should be transferred to Citadele, Among the shareholders of this financial institution one can find Ripplewood Holding, that has a stake of 22.4% in Citadele. This holding was founded by a prominent American businessman, Tom Collins, who is a member of the board of directors of the American banking and financial corporation Citigroup. Two other American prominent financiers, namely the former US Federal reserve chairman, Paul Volcker and the former president of the World Bank, James Wolfensohn share a collective stake of 52.6% in Citadele. So it looks that no affection was spared between the faithful NATO allies, in spite of things looking all rosy on the surface.